The locavore trend has arrived at your local amusement park. Fresh, locally sourced foods and customized menu items are transforming a culinary landscape long dominated by frozen hot dogs, processed chicken fingers and generic soda pop. So rather than “reinvent the wheel,” as he put it, with a slew of new menu items, Padilla’s team worked to upgrade the quality of the classic fare park-goers love. Burgers are made from fresh beef instead of frozen, pizzas are made to order with homemade dough, and chicken strips are hand-breaded in-house, Padilla said. It’s all washed down with beer from a local brewery, Badger Hill, which recently crafted a specialty brew for Valleyfair’s 40th anniversary. “People realize that it’s a local brand that is up and coming, and we did very well,” noted Padilla, who said the beer sold out in a matter of weeks. Kiara Nazario of Six Flags New England. Serving classic foods with custom elements is a trend for the park. 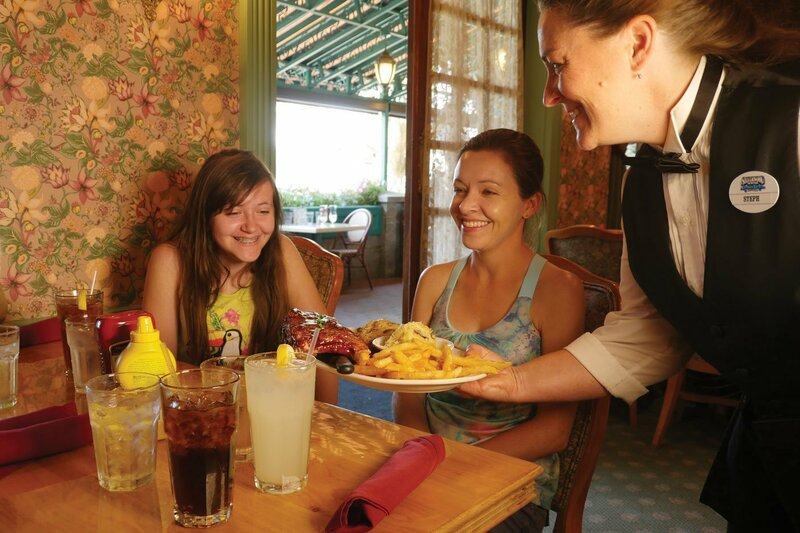 In Athol, Idaho, David Lee has noticed a similar locavore tendency among the 660,000 annual visitors at Silverwood Theme Park, where he is food and beverage manager. In response to consumer demand, for the 2016 season, Silverwood moved away from processed and frozen foods, replacing them with house-made or locally sourced pulled pork, chicken, pastries, cold cuts and Mexican fare. At Six Flags New England, the park uses strategic signage to draw attention to its two dozen eateries. Shown is Mahki Scott handing over a dessert at one of the locations. The local approach also extends to menu items at many parks. Valleyfair’s guests come mostly from Minnesota and the Upper Midwest, so Padilla has found success with limited-time food specials that reflect the area’s heritage. For 2017, he plans to bring back a series of “hot dishes” – Minnesotan favorites like shredded chicken baked with rice – accompanied by local brews. “People have responded really well; it speaks to this market,” he said, adding that Valleyfair boosts food sales through promoting its offerings on dining plans for season pass holders. 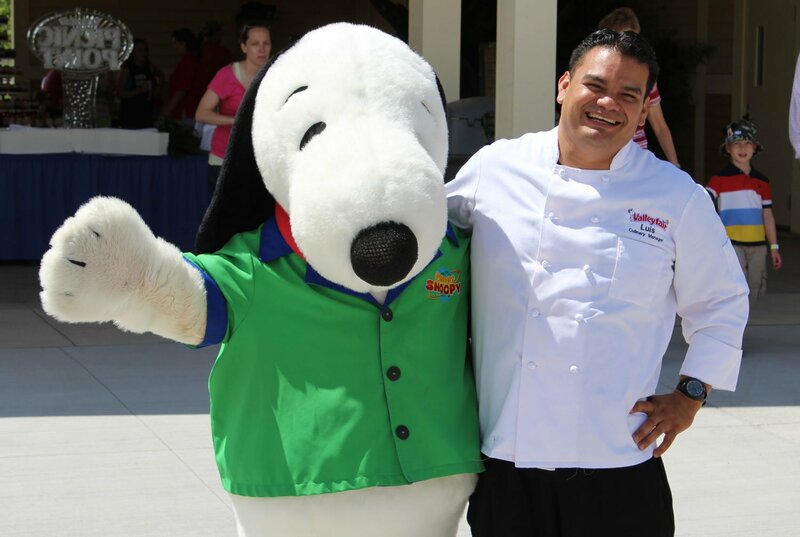 Valleyfair Executive Chef Luis Carrillo with a Snoopy character. A local brewery recently crafted a specialty brew for the park’s 40th anniversary. Local tastes also dictate menu trends at Lagoon Park, an amusement park in Farmington, Utah, just north of Salt Lake City. This region is home to a large population of Mormons, whose religion prohibits them from drinking coffee and alcohol – which means that soda is extremely popular, said Assistant Food Manager and longtime employee Aaron Small. “Everyone in Utah starts the day with Diet Coke,” he said, explaining why the biggest hit of the 2016 season has been a line of novelty soda add-ins. At a Swig brand soda fountain, guests can customize Coke or Pepsi with flavored syrups and top the drinks with specialty ices. “It’s really a great product. We’ve been so surprised at how well it’s done,” said Small. He noted that add-ins are a positive overall trend for beverages, with candy not only making milkshakes bigger, “it makes the prices bigger, too,” Small said. Nina Gorgan of Six Flags New England. Made to order wraps, salads and sandwiches are top sellers for the attraction. Across the country at Six Flags New England, customized classics are also a trend, said Michelle Lee, culinary service manager at the Agawam, Mass., theme park. 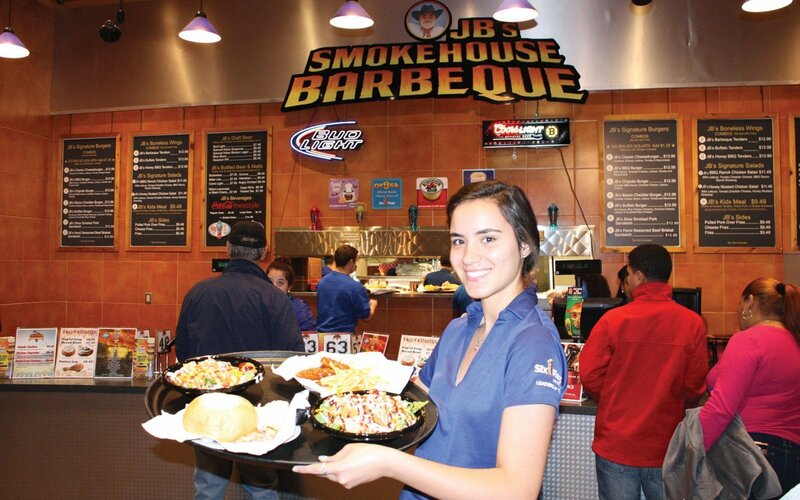 Made to order wraps, salads and sandwiches are top sellers, and for 2016, a team helmed by In-Park Services Director Lisa Laing created design-your-own meals based on macaroni and cheese. These include a mac and cheese filled bagel “conewich,” and grilled sandwiches with various mac and cheese fillings. “Our guests like the ability to modify based on their specific needs or personal preference, and we are happy to accommodate them,” Lee said. But too many choices can create problems, too. Food specialists at parks around the country talk about the fine line between offering variety and slowing down service with long lines and wait times, something David Lee works to avoid at Silverwood. At the park’s multiple dining venues, Lee’s team relies on simplified menus and a well-trained staff who can quickly answer any questions. “This in turn speeds up the lines and doesn’t set back the flow of the operation,” he said. Silverwood also cut back the number of flavors it offered at its Carnival Ice Creamery; by removing the lowest sellers, decision-making time was cut in half for ambivalent ice-cream buyers, resulting in far greater sales and efficiency, he said. At Six Flags Discovery Kingdom, in Vallejo, Calif., the food team rolled out new offerings for a limited time only, said David Zellner, who oversees culinary operations as in-park service director. Throughout the summer of 2016, Six Flags Discovery Kingdom served French fry platters with an international twist for the Summer Olympics: “Rio Delicioso” fries topped with Brazilian meats and cheese and a cheeseburger variation to honor Team USA. The park also offered limited-edition fudge, pizzas and seasonal funnel cakes – including a Pokemon version to capitalize on the game craze. 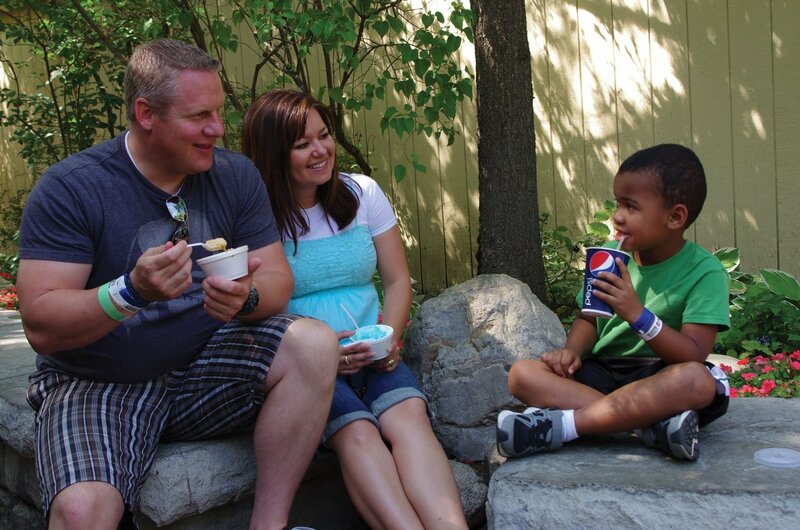 A family enjoys ice cream during the summer at Silverwood Theme Park. The park has cut back the number of flavors it offers at the Carnival Ice Creamery, and the result has been far greater sales and efficiency. Limiting all that variety to specific time periods is efficient, and it helps sell more food by offering more exciting options to season pass holders, said Zellner. At multiple Six Flags locations, managers said the park’s All Season Dining Pass is the best dining value available, with a meal included in every visit. But all those deals only translate into food sales if guests know about them. That’s why Michelle Lee at Six Flags New England said the park uses strategic signage to draw attention to its two dozen eateries. “Signs, photos, spiels and team member communication are essential to get the word out,” Lee said. The park also recently enclosed four of its sit-down restaurants so guests could relax in air conditioning, which encourages customers to linger, and buy more food. At Silverwood, David Lee agreed that enticing visuals are key to selling snacks. “Consumers are becoming fascinated with how foods are prepared and made,” Lee said. So the Silverwood team lets guests gawk at the massive barbecue pit and watch his cooks make fare like kettle corn, caramel apples and fudge. “It creates a memorable, visual experience,” Lee explained. Guests being served at a Silverwood Theme Park restaurant. The attraction’s visitors hail from a 350-mile radius that includes Washington State, Montana and southwestern Canada, and a regional focus is a selling point for food. Also memorable: the gorgeous North Idaho landscape, which provides the backdrop for what Lee considers the park’s best food bargain. That’s the all-your-can-eat barbecue buffet for $12.99, which includes watermelon, mashed potatoes, chicken and pulled pork. Value, of course, is subjective. 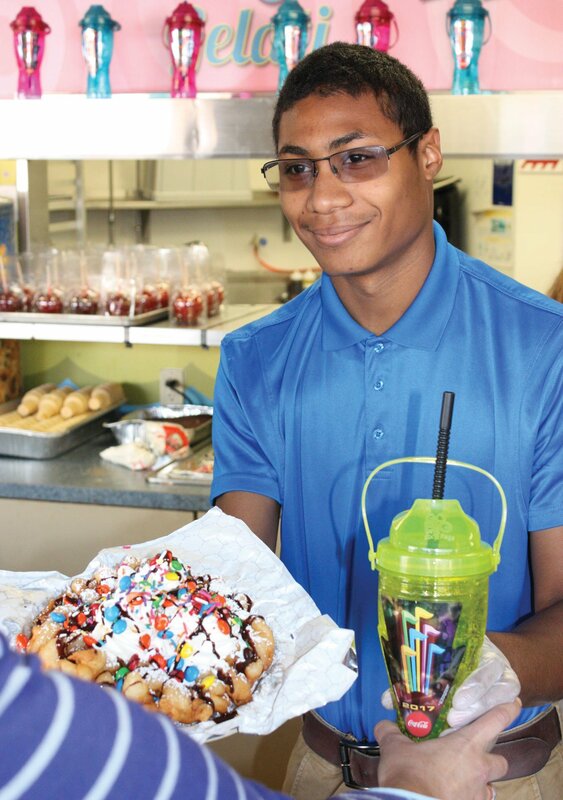 At Lagoon Park, which services 1.5 million guests annually, Small said the best bargain is the $7.99 funnel cake – an amusement park classic that’s so big “you can share it with three people,” he said. For 2017, the trend-conscious food manager is mulling new options in line with today’s appetites; Hawaiian shave ice, taco trucks, and branded specialty burgers are on his radar, Small said. “And we’ve always wanted to do a meatball and Philly cheesesteak stand,” he added. It sounds delicious – just as long as those meatballs are locally sourced.